So I realized that my blog posts weren't posting in the right area of the webpage so I'm having to resist everything in the correct format! 3/17/14: Happy St. Patrick's Day! Last week I babysat while the parentals went out of town on a business trip. The younger kiddo (10y) has been really interested in art lately, and since he's homeschooled I decided to give him a bit of an art project! We did these two paintings! Each painting took 3 separate layers, about an hour for each one. 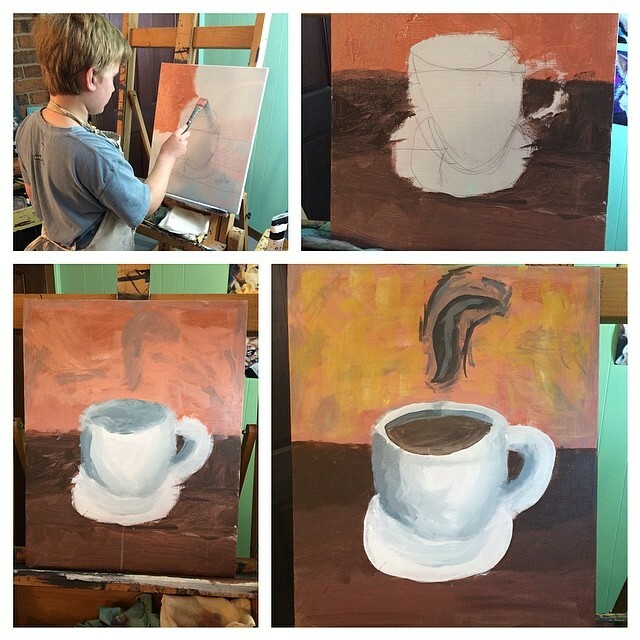 Since these were his first paintings ever, I decided to mix the colors for him--but explaining to him how I went about doing so! I think that we will meet up weekly from now on, and I'll give lessons on how to mix colors, try different media, etc. I'm really proud of my first student! !